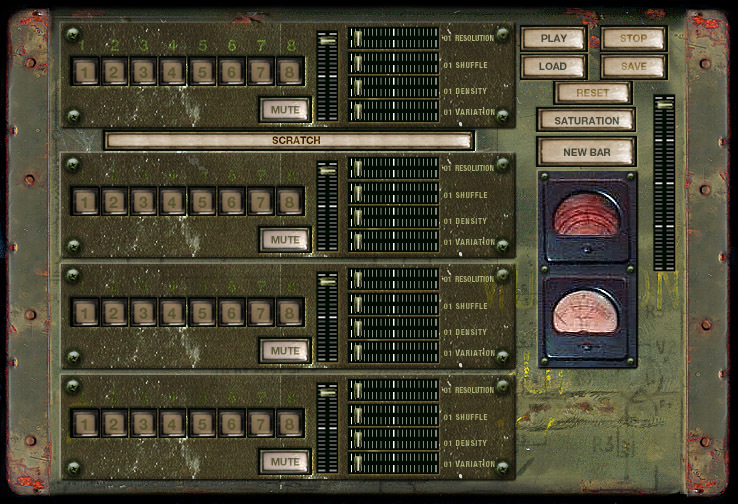 This GUI for DJamm never actually made it onto the software. But this was exactly how we wanted it to look. The functionality of DJamm was as shown here: 4 channels of loops each of which could be cut up by the Coldcutter ‘buffer shuffle’ algoriddim. 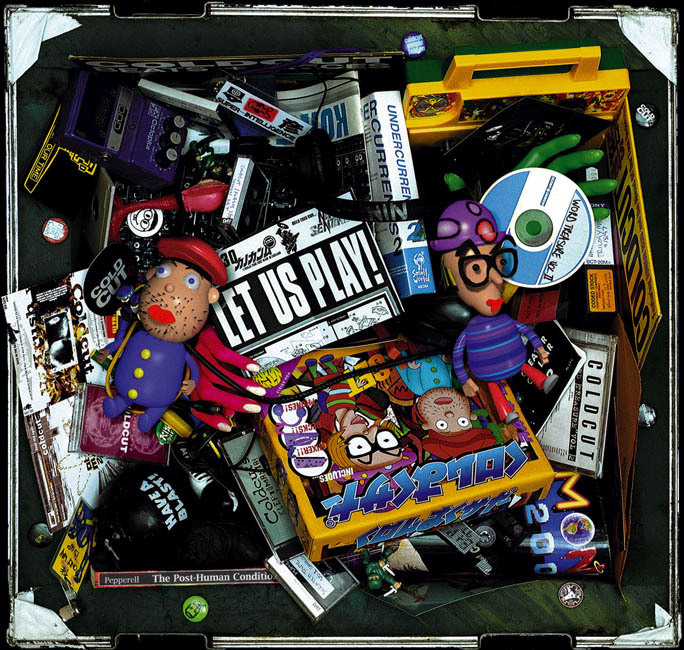 DJamm was Coldcuts audio instrument for live performances in the ‘Let Us Play’ period c. 1996-2002; it is now reborn as Ninja Jamm for iOS and Android. Developed by Robert Pepperell and Coldcut and made by Abiku Designs. 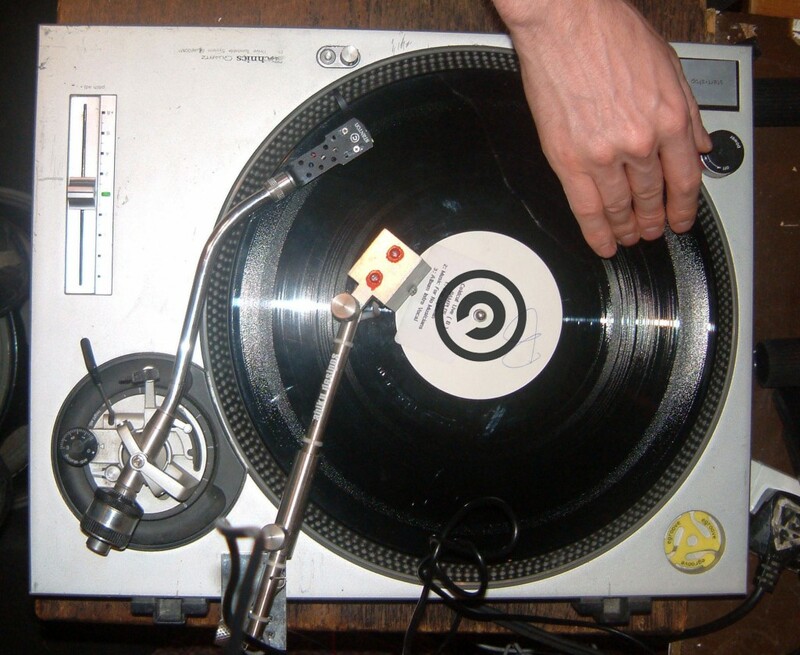 The Dextractor was an extra tracking arm and cartridge which contained a mouse wheel that made contact with the vinyl. Scratching action moved the mouse wheel backwards and forwards generating a stream of data which we could read in our custom scratching software which predates Final Scratch, Serato etc. Album Artwork by Strictly Kev. The toys in the box formed the basis of a GUI in the included CD-ROM of software playtools. Jon’s set Includes 2 x PC laptops running WinNT + DJamm + Vestax DJ Mixer + Pioneer DJ FX. Matt’s set : 2 x PC laptops WinNT with VJamm + Vestax Mixer with extra Xfader controlling custom AVE5 Video Mixer. VJamm provided AV samples played over backing visuals from Sony VCD players. Matt’s setup built by Ali Todd. Photo by Strictly Kev DJ Food.